The Notre Dame Cathedral has overcome The French Revolution, Huguenots and world wars, so there is no doubt it will rise again as one of the planet’s most iconic sights. The classic Cathedral may have been partially destroyed but the novel lives on. It is set in 15th-century Paris and powerfully evokes medieval life in the city during the reign of Louis XI. Quasimodo is the hunchbacked horribly deformed bell ringer at the cathedral of Notre-Dame. Once beaten and pilloried by an angry mob, he has fallen in love with the beautiful gypsy Esmeralda, who took pity on him during this ordeal. When the scheming archdeacon Frollo, who is also obsessed with Esmeralda, discovers that she favors Captain Phoebus, he stabs the captain, and Esmeralda is accused of the crime. Quasimodo attempts to shelter Esmeralda in the cathedral, but she eventually hangs; in his grief and despair, Quasimodo throws Frollo from the cathedral tower. Later, two skeletons are found in Esmeralda’s tomb—that of a hunchback embracing that of a woman. Victor Hugo’s The Hunchback of Notre Dame is a historical novel in the tradition of Scott’s Ivanhoe. It presents a vivid tableau of life in fifteenth-century Paris, a city teeming with noble festivities, grotesque revelries, mob uprisings, and public executions, all of which take place around Notre-Dame. Hugo devotes two chapters to the description of the Gothic church, bringing the reader into the very soul of Notre Dame. From the dizzying heights of its stony gaze, he offers the reader a subjective view of Paris. The word “fate”, etched on one of the walls, reveals the driving force of the gothic plot. Great edifices, like great mountains, are the work of centuries. Art often undergoes a transformation while they are pending, pendent opera interrupt; they proceed quietly in accordance with the transformed art. The new art takes the monument where it finds it, incrusts itself there, assimilates it to itself, develops it according to its fancy, and finishes it if it can. The thing is accomplished without trouble, without effort, without reaction,— following a natural and tranquil law. It is a graft which shoots up, asap which circulates, vegetation which starts forth anew. Certainly, there is the matter here for many large volumes, and often the universal history of humanity in the successive engrafting of many arts at many levels, upon the same monument. The man, the artist, the individual, is effaced in these great masses, which lack the name of their author; human intelligence is there summed up and totalized. Time is the architect, the nation is the builder. All these shades, all these differences, do not affect the surfaces of edifices only. It is an art which has changed its skin. The very constitution of the Christian church is not attacked by it. There is always the same internal woodwork, the same logical arrangement of parts. #CityImages wants to hear from you to share your Notre Dame Cathedral photos and memories and we’ll publish some of them. 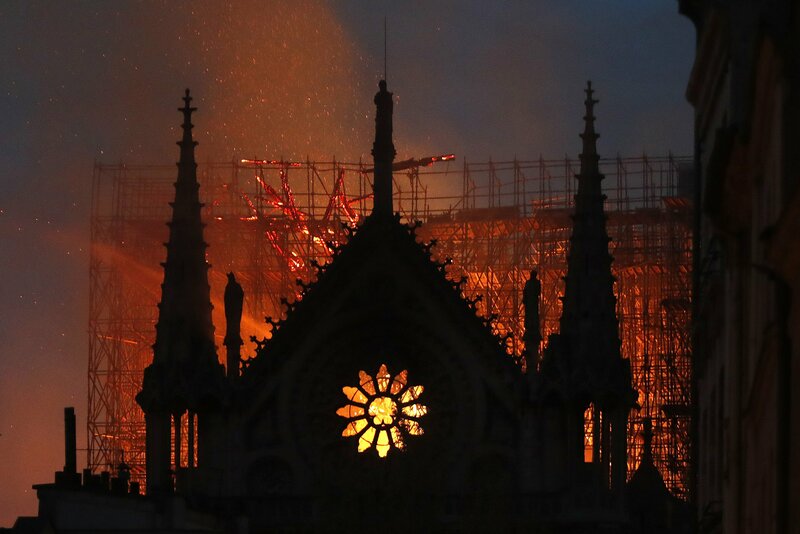 A massive fire was raging Monday at theÂ famed Notre Dame cathedral in Paris, one of the world`s most popular tourist destinations.